A Cervical Stellate Ganglion Block is a procedure that may be performed to determine the cause and/or to relieve chronic pain in the face and head, arms and chest. This type of pain is caused by increased sensitivity of the nerves found at the level of the sixth and seventh cervical (neck) vertebrae. This collection of sympathetic nerves is called the stellate ganglion, and to reduce pain, a Chronic Pain Specialist must block its activity using local anesthetic injections. 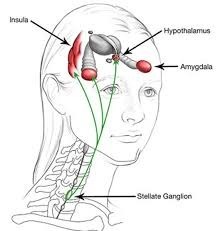 The stellate ganglion is a sympathetic nerve which becomes hyperactive due to chronic pain. Conditions like herpes zoster, Raynaud’s Disease, phantom limb, cancer, frostbite, and Complex Regional Pain Syndrome lead to symptoms often unrelieved by medications or conservative therapy. These symptoms include intense burning pain, an increase or decrease in temperature in the affected area, and increased sweating in the area. The goal of a cervical stellate ganglion block is to break the cycle of pain and sympathetic nerve activity and to improve blood flow to the area. This helps to desensitize the nerves and encourage healing of tissues. 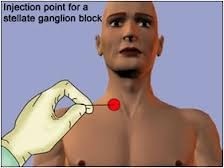 A cervical stellate ganglion block consists of injection of local anesthetic into the front of the neck. It is a short, minimally invasive procedure that can effectively treat a wide array of conditions unresponsive to medical management. It provides relief for sympathetic-related pain in face, chest, and upper extremities, improves circulation in the upper extremities and face, decreases perspiration in upper extremities and face, and reduces hot flashes and associated sleep disturbances. A Chronic Pain Specialist first determines if a patient is a candidate for the block, and prepares him for the procedure, which will be done on an outpatient basis. 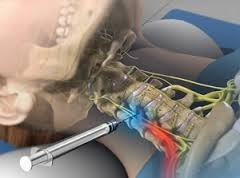 The injection is usually quick, taking only several minutes for each side of the neck. A small amount of sedation may be given to decrease anxiety. Monitors are used to watch the patient’s blood pressure, heart rate, and blood oxygen. After sterile preparation of the neck region, the injection site is determined using X-ray guidance. A local anesthetic is applied to the injection site, which helps decrease the pain at the injection site. The needle is advanced toward the location of the stellate ganglion, which is confirmed using liquid contrast. The local anesthetic medication is then injected, and the needle is taken out at the end of the procedure. The patient is monitored for about an hour in the recovery area and discharged within the day. A little soreness may be felt in the injection site, but the pain in the face, chest, and arms will be significantly relieved. Patients may also experience a droopy eyelid, redness of the eye, warmth in the face and hoarseness of the voice, but these effects are temporary and may last only a few hours. Injections may be repeated after a few weeks if needed. A Cervical Stellate Ganglion Block is a minimally invasive, safe, and effective means of treating pain in the head, face, chest, and arms that is unresponsive to other forms of treatment. If you want more information about treating chronic pain, contact our Pain Management Specialist who will examine you and conduct tests to determine the cause of your pain. Make an appointment with the NYC’s top board-certified interventional pain management physician to know if Cervical Stellate Ganglion Blocks are a treatment option for you.